The recently announced project led by IACMI could help enable innovation in wind turbine manufacturing. The Institute for Advanced Composites Manufacturing Innovation (IACMI) has announced a project focused on thermoplastic composite advancements for wind turbine blades. While thermoset composites reinforced by fiber are the current material of choice for large-scale wind turbine components, challenges in manufacturing costs, performance, and recyclability are limiting, the organization says. 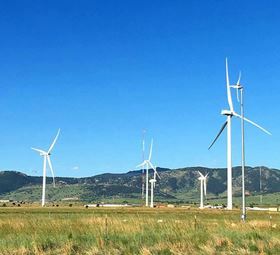 The IACMI plans to investigate new developments in thermoplastic materials with industry partners to lower production costs, improve the recyclability of wind turbine blades and expand applicability to components demonstrated at large scale. Project partners include Arkema, Inc and the Nondestructive Evaluation (NDE) teams from Vanderbilt University and University of Tennessee, Knoxville. Simulation tools will be developed in conjunction with Purdue University and Convergent Manufacturing Technologies. The NREL National Wind Technology Center (NWTC) will manufacture full-scale blade components in the new Composites Manufacturing Education and Technology (CoMET) facility. This story is reprinted from material from IACMI, with editorial changes made by Materials Today. The views expressed in this article do not necessarily represent those of Elsevier. ELG Carbon Fibre Ltd has joined the Institute for Advanced Composites Manufacturing Innovation (IACMI), based in the US. US composites institute IACMI teams has unveiled a 9 m long prototype wind blade.